Sarah Walker began her musical life as a violinist at the Royal College of Music in London and subsequently studied singing with Vera Rozsa, with whom she has built up a wide repertoire ranging from Bach to twentieth-century works by composers such as Berio, Boulez, Cage, Henze, Ligeti, Copeland and Ives. Miss Walker is much in demand on the concert platform worldwide and has worked with Ozawa, Davis, Mackerras, Solti, Norrington, Boulez, Rozhdestvensky, Masur, Harnoncourt and Rattle. She appears regularly with the major British orchestras and at the major British and European festivals. She was a memorable soloist at the Last Night of the Proms and sang under the late Leonard Bernstein in Beethoven's Ninth Symphony in Berlin to celebrate the opening of the Berlin Wall (televised worldwide and recorded by Deutsche Grammophon). She is closely associated with the Royal Opera House, Covent Garden, where she has sung Baba the Turk in Stravinsky's The Rake's Progress (recorded for Decca), Charlotte (Werther), Mrs Sedley (Peter Grimes) and new productions of Sallinen's The King Goes Forth To France, Maxwell-Davies' Taverner, Le Nozze di Figaro and Handel's Samson. With English National Opera her many roles include Mary Stuart, Charlotte, the Countess (The Queen of Spades), Cornelia (Julius Caesar), the title role in Britten's Gloriana and Katisha in The Mikado. Her Vienna State Opera debut was as Didon in Les Troyens; she has performed Cornelia in Geneva, Ottavia and Cornelia in San Francisco, Magdalene in Chicago and Cornelia and Micah at the Metropolitan Opera. Her Glyndebourne debut was as Diana in Cavalli's La Calisto and she has since sung Monteverdi's Ottavia, Penelope and Poppea. Sarah Walker has perhaps received the greatest critical acclaim for her recitals. Since the overwhelming success of her Wigmore Hall debut she has visited all the major European cities and Festivals, the USA, Australia and New Zealand and has made numerous recordings which reflect her vast recital repertoire. 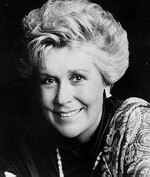 Sarah Walker was made a CBE in the 1991 Queen's Birthday Honours.